My wife gave me a C- on this blog yesterday so I had to start over and provide you with better than C- work. This week's Gospel reading definitely deserves better than C- because as we see in this portion of the sixth chapter of John, Jesus explains in His own words why we need the Eucharist. In the past, I have reworded what people say in scripture in a way that people might better understand. Forgive me for not doing that today because so much of what is written is red-letter stuff. Since I'm writing to Catholics, and we know there are many Catholics who don't read the Bible, let me explain. In many Bibles, the words of Jesus are written in red to draw attention to them. I'm not going to pretend to be able to improve one what Jesus said or improve on the inspiration of the Holy Spirit (I'm humble like that) so let me just write what Christ said. In the Eucharist, bread and wine is consecrated and transformed into the body, blood, soul and divinity of Jesus Christ. In the Eucharist, we are following the directions of Jesus in this passage. Jesus is explaining to us why we need the Eucharist. Let's break it down to the five reasons Jesus says we need to eat His body and drink His blood. If you do not you will not have life in you. If you do not have life in you then you are dead. You are physically and spiritually dead. Whoever does has eternal life. Eternal--you know--today and tomorrow and forever and ever. Isn't that what we all want?? Whoever does remains in Christ and He in us. Even if we live for eternity but it's not with Jesus then it's not worth it. A day without Jesus in you is a day wasted. I know for me those days where I have not made Jesus a part of my life just seem blah. God, the Father, had God the Son become incarnate and gave Him life. 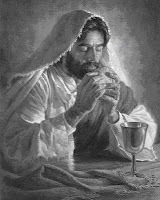 Jesus reiterates that whoever eats and drinks will, like Him, have life. All of our nourishment on Earth, even though it's provided by God, still only leads to death. It is through the Eucharist that we are given life. We will get into more of the apologetics next week but one thing is interesting. Jesus is not being symbolic here. He is speaking of flesh--actually meat. When he says "eat" the actual word he is using means "gnaw" or "chew" like one would do when we eat meat and not eat as in when we eat bread. In this passage, Jesus is pleading with us. He is repeatedly saying whoever eats His body and drinks His blood will have eternal life and whoever doesn't shall die. He's not saying do something that is LIKE eating and drinking. He is saying we must actually eat and drink. And yet people fail to partake in the gift Jesus gives us. People belittle it and say it's only a symbol. People who take every other Bible passage in a literal sense seem to gloss this passage over and say that Jesus does not mean eat his flesh and drink his blood when that is exactly what He is saying. Or sadly, people demean the Eucharist and let the opportunity pass by and miss mass choosing to sleep in. Worse yet, they partake in the Eucharist when they are in a state of mortal sin. Wake up, people! Jesus is saying we must eat and drink His flesh and blood. Let yourself be nourished by Christ. Let Jesus live in you and you in Him.